Land Rover Experience Eastnor01531 638777work ExperienceYou’ll drive across more than 5,000 acres of ground and 66 miles of challenging off-road trails in the stunning location of the Eastnor Castle estate, whilst pushing both yourself and the latest Land Rover vehicles to the limit. Eastnor has been used for decades as a test facility to refine the off-road capabilities and technologies for every new Land Rover, its high clay content soil is fine and clingy - making it the perfect place to test the iconic vehicle’s power and ability. You’ll be guided by our expert instructors, who have a wealth of knowledge about Land Rover vehicles, and will work in partnership with you to push your boundaries, step out of your comfort zone, and develop your skills. •	Taster experience - A one hour introduction into the exciting world of off-road driving. You won’t need any previous experience, and you’ll be guided by our instructors to boost your confidence as you try out a series of inclines, descents and water wading from behind the wheel of a trusted Land Rover. •	Half-day experience - A three hour session that will see you navigate steep inclines, descents, side slopes and streams, whilst gaining a greater understanding of vehicle control, obstacle handing and assessing different environments. •	Full day experience - An unforgettable seven hour adventure that’ll see you navigate across various off-road elements with a qualified instructor to boost your confidence and prepare you for real world challenges. •	Advanced experience - This seven-hour session offers fully immersive driving training, and will teach you off-road techniques to an expert very high standard. You’ll be pushed to your limits on Eastnor’s slippery terrain, steep inclines, deep water, roller beds, rock crawls and bridge crossings. 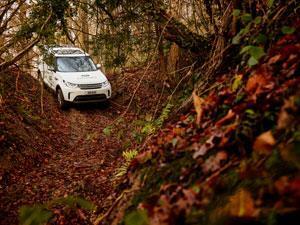 •	Eastnor experience - A three-day adventure that you will never forget. It is a progressive journey where you will tackle deep water, dense woodland, steep hills and thick mud - with the ultimate goal being to build and drive across your own bridge! Delivered as a progressive journey set over 3 full days, our intrepid Explorers will tackle deep water, dense woodland, steep hills and thick mud. The ultimate goal being to put your new skills into action by building your own bridge and driving across it! Exclusive Experience: £599 per vehicle per expedition, with space for 3 intrepid Explorers to share the adventure. You’ll drive across more than 5,000 acres of ground and 66 miles of challenging off-road trails in the stunning location of the Eastnor Castle estate, whilst pushing both yourself and the latest Land Rover vehicles to the limit. We strongly recommend customers approaching along A417 (including those leaving the M50 at Junction 2) travel through Ledbury town centre to avoid Clencher’s Mill Lane, a notoriously narrow lane with a ford crossing which can feature in some Sat Nav directions. Thank you for your co-operation, it helps Land Rover Experience minimise any impact of our operations on residents in the area.